Please review this position statement from the American College of Medical Toxicology (ACMT) and American Academy of Clinical Toxicology (AACT). This paper outlines recommendations for personal protective equipment (PPE) when dealing with fentanyl or fentanyl analog exposures in the field. Homeland Security has issued a statement that contrary to recent news reporting, there are no fentanyl analogs resistant to Naloxone. Download the Homeland Security article. Download Fentanyl Safety Recommendations for First Responders. This one page handout provides information to help first responders protect themselves when the presence of fentanyl is suspected or encountered. The following fact sheets are in PDF format. Print and replicate as needed. Poison Centers in the United States are regularly consulted by health care facilities to provide treatment recommendations regarding poisoned patients. 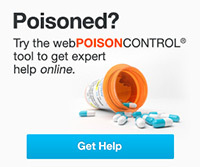 Poison centers provide up to date, evidenced-based information on toxicity and treatment 24 hours a day at no cost. They are backed up by medical toxicologists.